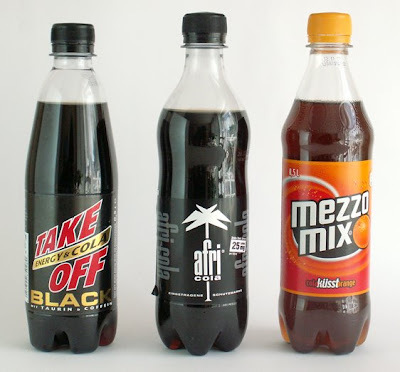 Here are 3 cola's I bought in Germany, and when I looked at the beverages in Germany they probably got the most kinds compared to other countries in Europe. Also there is a new Red Bull in Germany the Red Bull cola but haven't saw it in store only advertisements of it. For the review I will take it slowly cause I am not going to sip all of them in one day, will do that slower. 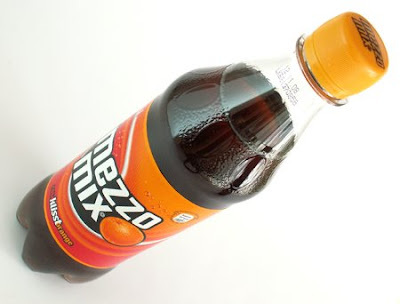 I already had drank Mezzo Mix in Germany at the home of Paavo Blofield who is a great photographer. If I can compare the taste, it is the better version of Coca Cola Light Zango. However I spotted this is a brand is from Coca Cola Company it self so not sure why they don't introduce this normally everywhere, cause in Germany it's very big already. The bottle I kind of remember it is a very old bottle design. Not sure if it is still a Coca Cola bottle though or Fanta. But do love the logo and the design of the label. I haven't had time to visit or find a supermarket but did saw cans at some stores but they were the same as the ones in the Netherlands so Kassel isn't a testground. So still no luck on finding the reclosable can of Coca Cola. I really want to get my hands on one though, if anyone in Germany actually know which place they do sell them please email the location to me.